November 23 is a national holiday and Georgia’s Orthodox Church marks Georgia , Saint George’s torture on a wheel. In relation to this day religious services have been held throughout all churches in the country. Saint George (Giorgi in Georgian) is one of the most beloved martyrs and considered to be the patron saint of the Georgian nation. There are about 365 churches built in his name. Moreover, many Georgian’s have been named after him. Currently, according to the data 190 269 Giorgis live in the country and 1867 babies were named Giorgi in 2016. Saint George was born in the family of a noble military man. He was Cappadocian by origin and grew up in Palestine. His parents were Christians and his father was killed because of it. After that, his mother returned to her native Palestine, where she raised her only son. George, like his father, became a military man for Roman army. He was Emperor Diocletian’s favorite and everybody predicted a great future for him. But then, the emperor signed a decree on the persecution of Christians. When George learned about that, he freed the slaves and servants, consequently presenting himself at the emperor’s court and fearlessly admitting that he was Christian too. His torture began on November 23. He was lacerated on a wheel of swords, which was made specifically for this particular purpose. George was praying as long as he could and when the torturers thought he was dead, they left him tied on the wheel and went to pray to the idols. But, at that very moment, there was a voice from heaven: ‘Don’t be afraid, George, I am with you’ and an angel came down to untie him from the wheel. Absolutely unharmed, George stood up and followed the emperor, to prove that the Christian faith can do miracles. However, the emperor refused to believe what he saw and ordered to put George in jail. But in three days George again freed himself. After that, he was tortured again. They wanted to humiliate him by offering to resuscitate the dead. However, they were ashamed themselves, when they saw a dead man walking out of a tomb. After that, they tried to seduce him by promising the golden mountains, but everything was in vain. George refused to deny Christian faith. Finally, the emperor ordered to behead him. That was the end of several-month long torture of Saint George. November 23 is the beginning of his martyrdom and it was Saint Nino who preached Christianity in Georgia and ordered this holiday to be observed every year. 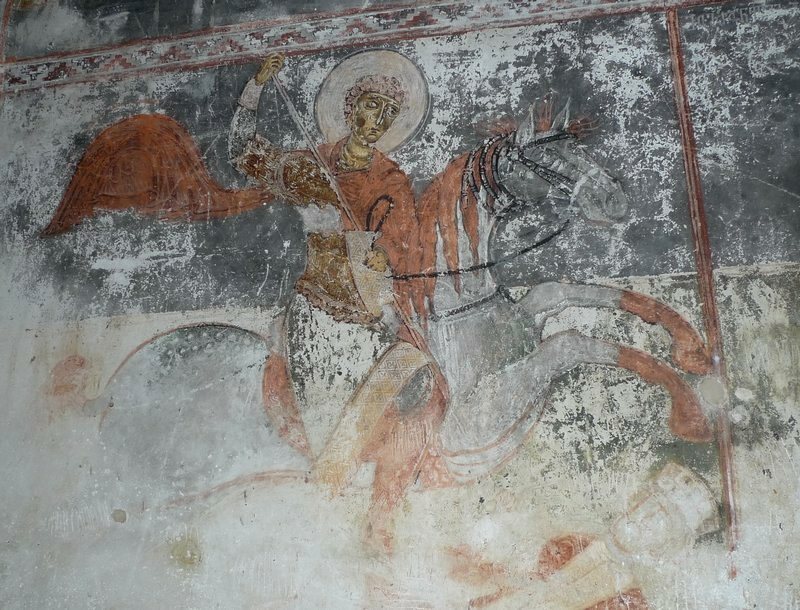 As a rule, Saint George is depicted on icons slaying a dragon that symbolizes evil, yet this fresco in Svaneti’s Ipari church features Emperor Diocletian instead. It should be noted that this day is the Saint George’s day only in Georgia. May Saint George’s prayer bless Georgia!